A bill at the Capitol makes it easier for parents to opt out of having their kids take certain statewide tests at school. Under the measure, schools would be required to send a letter to parents once per year — listing all scheduled state-mandated standardized tests, explaining the purpose of the exams, and detailing how to opt out. 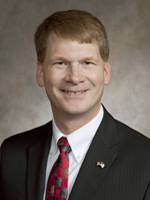 Representative Jeremy Thiesfeldt (R-Fond du Lac) is the bill’s (SB-193) author and Assembly Education Committee chair. He says current law is confusing. “What I want to do here is lead the districts down the path of being more open with what it is they’re doing. Take the mystery out of it.” Thiesfeldt says schools would need to explain to parents why their kids should be taking the tests. Thiesfeldt says he’s not trying to get rid of standardize testing. He says he’s aiming for clarity and tightening up inconsistencies in the process. Members of the Senate Education Committee heard testimony on the proposal at the Capitol on Wednesday.